In the transaction screen you will see the Task Checklist, these are the items that need to be completed to close out a transactions. You will be taken to the disbursement, if you need to add or remove fees you can do that in here. For more information on adding fees to a disbursement please see the article below. The top section under commission breakdown is the information pertaining to the broker gross income and any debits or credit coming out of the brokers gross. Next you will see the agents commission- according to the commission plan they have been assigned. If they have any credits or debits you will see those here. The bottom section is a final breakdown of all the numbers. Any debits or credits from the above areas will also be listed in here. Verify the numbers are correct and click on Create Disbursement- this will save the financial information in the system. The next page gives you the option to choose any line items you would like to have printed on the disbursement page. You have the option to preview and save the disbursement and email the disbursement to either the title/attorney company, the agent or a custom email address. For more information on emailing the disbursement please see the article below. Scroll back to the top of the page and click on the Transaction Information page. You will see now the disbursement created box is checked off and the progress bar is now at 25% complete. 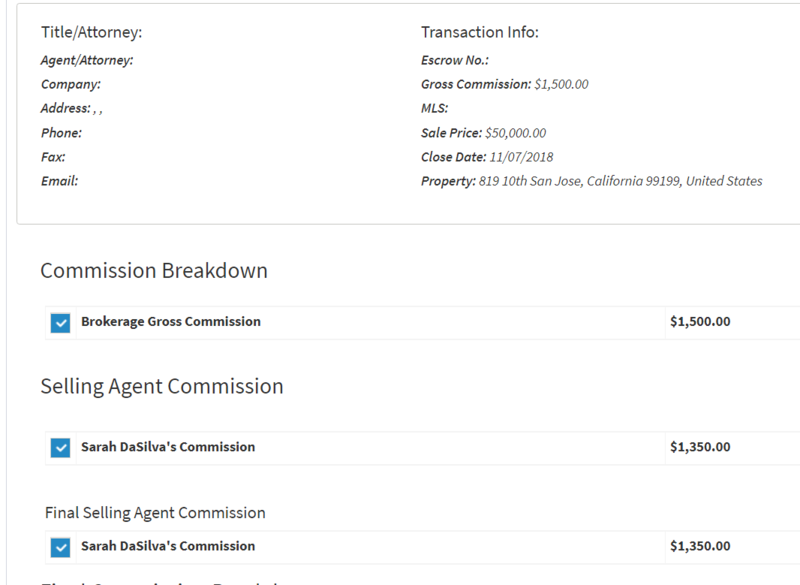 The next 2 items Disbursement Approved/Sent to Escrow are for manually tracking where the transaction is in the closing process, you can filter by these progress numbers on the view transaction page. The last step is to pay the agent. In this screen you have the option to mark as paid, if you are paying by check or some other means. Or if the agent is paid at Closing Table you can mark either one. If you are utilizing the ACH Transfer option you will have the option here to pay via ACH. For more information on paying via ACH you can see the below article. Once you have paid the agent either by marking it paid, paid at closing table or paid via ACH. If you are utilizing the Quickbooks integration you can click on Sync to Quickbooks to have it synced into your Quickboooks.